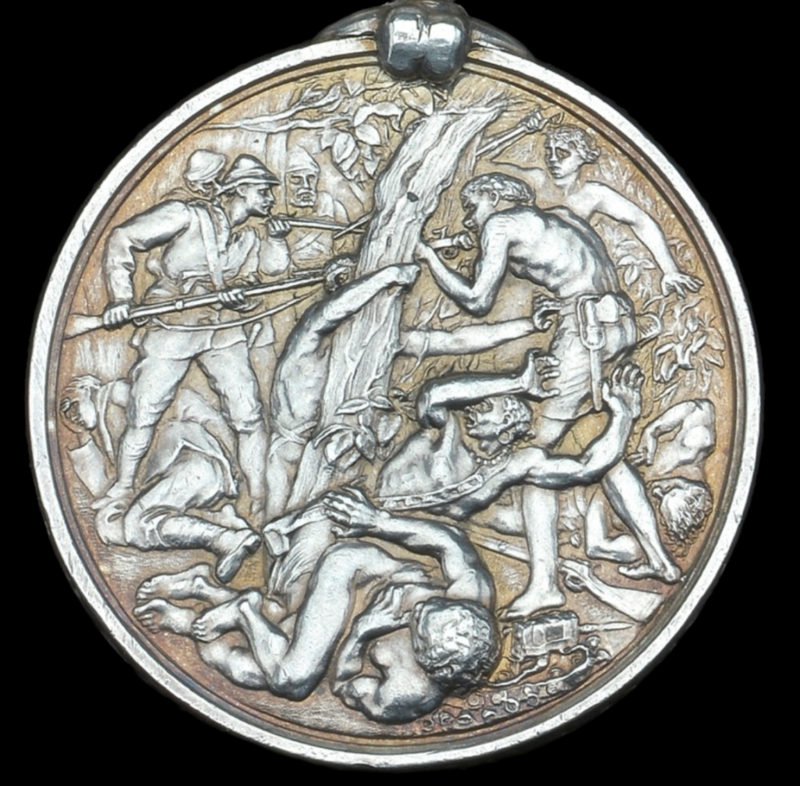 Many collectors describe the reverse of this medal which features bush fighting between British soldiers and Ashanti warriors as their favourite amongst the campaign medals issued during the Victorian period. The Coomassie clasp was awarded to those present at Amoaful and the capture of the capital, or those protecting the lines communication north of the Prah river. Only 240 medals with clasp were awarded to RN/RM personnel and although medals were awarded to men from 10 ships, almost half of them belonged to HMS Active. A clasp roll has been created from the roll compiled by Captain K.J. Douglas-Morris, R.N. and published by J.B Hayward & Son in June 1972 and is reproduced here with the express permission of Mr. Hayward. In addition, some information related to medals appearing for sale or at auction has been incorporated in to this database. Note: Since originally posting this, I have compared the roll to the roll which appeared 15 years later in the Captain’s book and added another 20 men who were not on the original roll published by John Hayward. The table above has been updated to reflect 260 men versus the original 240. The medal was sanctioned in June 1874 and was awarded for Wolseley’s campaign against the Ashantis under King Kofi Karikari and like most conflicts of the day, the source of the dispute lay with commerce and specifically the stoppage of the annual payment of £80 to the King for the use of the port of Elmina which occurred when the British bought the fort from the Dutch in April 1872 as part of the Dutch Gold Coast sale. After the British Gold Coast protectorate had been invaded by an Ashanti army in January and April 1873, the British with a lack of resources were unable to respond in a punitive fashion until Wolseley arrived in the autumn of that year with a plan to defeat the Ashanti and occupy their capital of Kumasi which was some 170 miles inland. Significant preparations were needed to build a road that would allow troops to reach the capital and could be protected and fortified along the route. Troops from the Black Watch, Rifle Brigade and Royal Welsh Fusiliers, along with the 1st and 2nd West Indian Regt. began arriving in December 1873 and by January the force moved inland to face the Ashanti warriors. The battle of Amoaful was fought on January 31, 1874 and after a decisive victory by the British forces, the capital was was reached on February 4. Kumasi was found abandoned and after a short occupation, the royal palace was demolished and the capital was burned. The Ashanti, signed the Treaty of Fomena in July 1874 to end the war. Among articles of the treaty included payment of 50,000 ounces of gold as indemnity for the expenses incurred for the war, an end to human sacrifice, freedom of trade between Ashanti and Her Majesty’s forts on the Coast and that the King of Ashanti would guarantee that the road from Kumasi to the River Pra shall always be kept open. More than 3,500 medals were issued to the RN/RM who served on 20 ships primarily as support for the Army and less than 7% were awarded to men who served ashore with the small Naval Brigade and were entitled to the clasp. The medal is engraved in serif capitals with the recipient’s name rank and ship and “73-74”. The addition of the dates following the recipient’s name distinguishes the medal from the East and West Africa medal which was issued with the same unusual reverse. Jim: I wanted to attach pictures and write-up of Frederick Pike RM who received a Coomassie clasp, but I haven’t figured out how to do it! Pick, I am not that familiar with the blogging software and the technicalities. I usually reach out to Peter when this gets a bit too technical for me. Maybe you can get some guidance from him at the conference. Last month, I purchased the excellent book by Nick Tucker entitled “The Ashantee Medal 1873-74 to the Royal Navy and Royal Marines” published by the OMRS. Nick includes a complete roll including medals to Kroomen. Of interest to me, was the fact that Kroomen were awarded 476 medals with the clasp which far out numbered the clasps issued to the RN/RM. These were issued unnamed and I think it’s still safe to state that the medals named to Kroomen rarely appear on the market. It’s noteworthy that the ribbon for the Ashantee Medal 1873-74 and the East and West Africa Medal 1887-1900 are identical: yellow with black borders and two thin central stripes. The ribbon shown above is for the Africa General Service Medal 1899-1956: yellow with black borders and two green central stripes. Thanks Glenn, I will need to look into getting a more appropriate picture. What’s the saying? can’t see the forest for the trees? My Great Great Great Grandfather was awarded this medal a John Thomas Miller Royal Navy. Unfortunately the medal is now lost from the family would be amazing to find the location of the medal.